This article is an overview on the options available to configure your domain in the panel. For an overview on domain hosting options, view the Domains Menu article. To view the options available to configure your domain, navigate to the Manage Domains page. To the right of your domain, click the Edit button. This opens your domain configuration page. The following lists all the sections and subsections along with an explanation of each. This section contains options for sites that are Fully Hosted on a DreamHost server. This option allows you to control how the URL of your site appears when visiting it. For further information, view the Adding or removing the "www" from your domain article. This section is where you assign an FTP/SFTP/Shell user to access the web directory of the domain. The dropdown menu allows you to select an existing user or create a new user to assign to the domain. All users are located on the Manage Users page. This field displays the directory on the server where your files are stored. By default, it’s set to a folder named the same as your domain name. In the example above, the name of the website is example.com. This shows the path on the webserver to your site’s logs. You can access them if your user is an SFTP or shell user. This dropdown menu allows you to choose which version of PHP to run on your site. 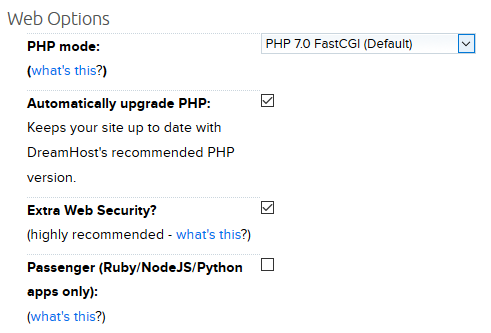 If this option is checked, you are allowing DreamHost to upgrade the PHP version on your domain to a recommended version. If you’re running an outdated version, then DreamHost automatically upgrades it after notifying you. By selecting Extra Web Security, you enable the use of a special security module for your website. It is recommend you keep this option checked. For more information on this option, please visit mod_security. This option is only available for sites running on a VPS. This enables OPcache which enhances PHP applications by caching compiled PHP code in memory. Enabling this feature is mainly intended to run Ruby on Rails- or Ruby/Python-based programs. If you do not need this feature, leave it disabled. For further information, please view the Passenger article. Cloudflare provides various tools that help accelerate and optimize your website. If you enable this feature, you are required to create an account or enter your existing Cloudflare account credentials to set it up on your domain. For further information, please view the Cloudflare article. Enabling this feature allows you to utilize Google Suite on your domain. You must first sign up for Google Suite and verify your domain ownership in order to enable this feature. For further information, please review the Google Apps article. When you are finished updating your changes, click the Change settings button in the center of the page to save them. This section allows you to redirect your current domain to any other domain you wish. For further information, please review the Redirect Domain article. A mirror allows you to upload your content to your server for one site (site A), but use another site’s URL (site B) on the same account to view the original site (site A). For further information, please review the Mirror Domain article. The DNS Only option provides the basic DNS for the domain without setting the site up on the web server to be hosted. If you wish to alter your DNS settings, please review the DNS and Custom DNS articles.